The Danville Public School Foundation’s ‘365 Club’ is looking for more support as it tries to provide some extra educational experiences for students. Bob Richard, Executive Director of the Foundation, says a breakfast meeting is being held at 7:15 this morning (Thursday, January 17, 2019) at the Turtle Run Banquet Center…. Richard says the Foundation has provided students some unique experiences…. 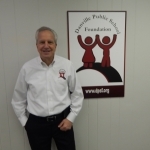 Richard notes the Danville Public School Foundation has been around for awhile…. The ‘365 Club’ breakfast is open to anyone considering supporting the Foundation’s efforts.